We finished our history early this semester so we enjoyed having something to fill in the gap. 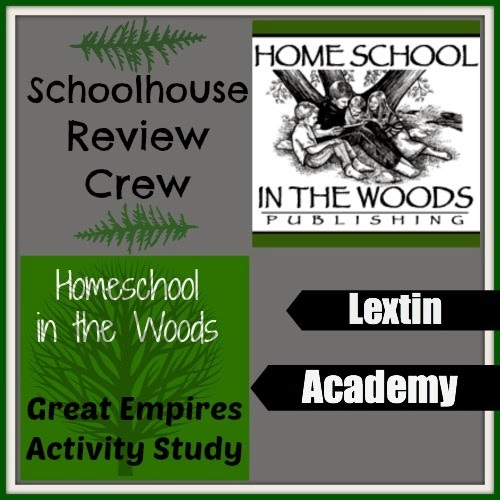 We reviewed the Great Empires Activity Study from Home School in the Woods! Home School in the Woods is a company that was started by a homeschool mom. They offer many history resources to make history studies come alive. Home School in the Woods has timelines with timeline figures that can be printed, lapbooks, and history unit studies. The products at Home School in the Woods are geared to promote a love of learning and to help students solidify a time frame for historical events. The history studies are written to show God working through history, illustrating in a visual way how the events came together. We received the Great Empires Study. This study is geared for elementary ages and provides a brief overview of 14 major empires throughout history, beginning with ancient Egypt and ending with the United States of America. This study is a download that opens a template from which you can print any page that you need. It retails for $18.95. You can also purchase a CD of the material for $19.95. The study contains a printable timeline with timeline figures to glue onto the timeline. There is also a map, activities, recipe ideas, book lists, and projects. There are also additional internet links for further study-these include pictures, text about important people and events, videos, and virtual tours. Some activity and project ideas include coloring and cutting out important people of the Spanish Empire, making a Kirigami pop-up fish for the Japanese Empire, and making a game board and playing a game for the United States of America. How did we use this curriculum? We didn’t do much history this year. Last year we covered ancients and this year we talked a little about the medieval period. Next year, I’m determined to make it through the medieval and renaissance periods. So, we used this program as our sole history resource for this spring. We started with ancient Egypt so that we could review. I hope to make it through the Viking Empire before we start school in the fall. (We’ll use this resource over the summer as well). Before we started I printed out the timeline and time figures. I also printed the activity guide, maps, map key, and overview text. I read through the overview of the empire and highlighted the main points, events, of people. I then looked through the book list and chose books for each unit. The book list has books that are appropriate for the younger set as well as selections for the older crowd. I made sure to use the simpler options. I also added in some of my own choices so that we would have several options in the picture-book category. I used the main events and main people and tried to find picture books on those topics. Then I looked through the activity ideas and made sure we had all the needed supplies. I also looked through the extra links provided on the site and chose which ones would most interest my kids. For the Egypt Empire, I read through the overview text myself and then summarized the main points for Curly and Tiger. Curly and I added the picture to her timeline page. Then we read one of our Egypt books. On the following days we would read more of her books (with Tiger listening in) and she would do the map work. Later in the week we would add in the activity. Of course, we read the books many many times. Curly and Tiger would often create their own projects based on our topics. For Egypt, Curly cut some Egyptian clothes out of paper and decorated them. They were like paper doll clothes. The kids also dressed up in dad’s undershirts as their “Egyptian clothes” and acted like they lived in Egypt. Over the next week, we would check out the links listed on the site and we kept on reading. Each Empire took several weeks. Hmmm……there wasn’t really anything we didn’t like with this one. It’s very flexible so you can do as much or as little as you like. If I could change anything, I would have two overviews for each empire. The one included with the curriculum is a great overview and perfect for the older age range. I would love a simplified version for the younger crowd. The projects listed for each empire are simple but very meaningful. They don’t require numerous supplies (or hard to obtain supplies). Therefore, I found the projects to be very doable! The overview sheets on each empire are very well-done. There is a lot of information packed into them. I did find it better if I read them beforehand as it was information overload for my crew. But I found them very helpful for myself. The downloadable template is so easy to navigate! Each empire is listed with clickable buttons for the overview text, activity page, map, and other printable pages. It was simple to find what I needed, print my pages, and be ready to use it with my kids. I loved the set-up. I was excited to see that the program also included a webpage link with additional links for each empire. It is time consuming and difficult to find appropriate websites to use with kids. This program has the legwork done for you. We really enjoyed the simple timeline with this project. We have not yet made a timeline (because they are too complex) but this was a great starting point for us and it helped my kids visualize the order of the events. The program offers additional reading suggestions which I found helpful. There were books for several different ages, making the program easy to use with several kids of differing ages. We love to read so I always welcome book lists. I was also very impressed with the maps. They were simple and large and very easy for Curly to read. The map assignments were clearly written and I found the Teacher Map Key very helpful in guiding Curly in completing the maps. This is such a fun study! It is very easily adaptable to a wide variety of ages and would make an excellent unit study to use with a large age range. We have had so much fun with the program! There is so much offered with each empire between the books, projects, cooking ideas, maps, and timeline that it can keep you busy for several weeks. However, I didn’t find the information to be overwhelming. There weren’t so many projects and activities that it felt like too much. I found this to be a perfect summer study for us – a great review of empires we’ve studied previously and a perfect introduction to the new empires that we’ll cover next school year. I think it would also be a wonderful addition to a history study since it would provide mapwork and projects. I know that I’ll refer to these studies multiple times during the summer or when we learn about the empires. We have had such a great time with the Great Empires Study and I think I’m going to try some more things from Homeschool in the Woods. Now I really want their timeline figures!!! What did the rest of the Crew think? Check out their thoughts on the Crew blog!